Looking to rekindle the flame? Reconnect with your loved one? Find romance? Well, Santorini is the spot to fall in love for the first time or all over again. From the breathtaking sunsets night after night to the delicious food this place attracts lovers from around the world. I had the chance to explore this island with my boyfriend, and there was something so magical about this spot. Hard to put a word on it, but when you are there you almost feel like you are alone in the world. Whether you love to take on an adventure with your SO or just relax on a beach, Santorini has something for you. 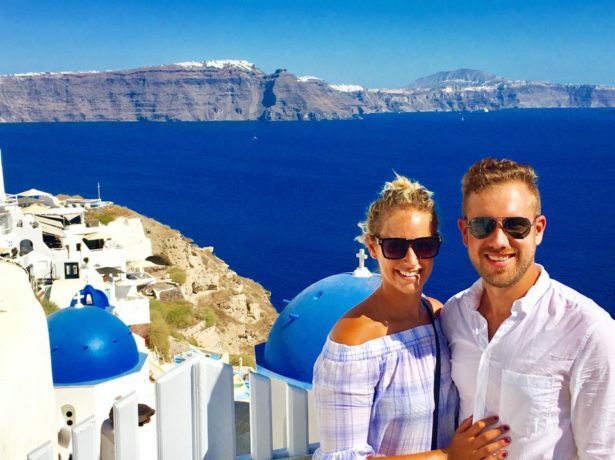 I am sharing with you my top nine romantic must do’s in Santorini. For the ultimate romantic getaway, you need to stay in the ultimate romantic town, Oia. Oia is located on the northern tip of the island and the traditional Cyclades village offers beauty you won’t believe. It is built on a steep slope of the caldera with many of the hotels and homes nestled in niches between the volcanic rock. For the ultimate romantic experience, book a room at Canaves Oia. The pool there hangs on the edge of the caldera which offers spectacular views. We started exploring this beautiful island by visiting Domaine Singalas Winery. 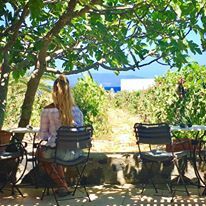 You don’t particularly think of wine when you think of Greece, especially with Italy so close by, but what makes Greek wine so special is its unique environment. Firstly, it is one of the few places in the world where you can get volcanic wine. The volcanic soil of Santorini really creates a different tasting experience. Secondly, their wineries aren’t afraid to experiment. Domaine Singalas is one of the more daring wineries on the island because of the different fomenting and aging techniques that create one of a kind wines. Every glass that I tried was more delicious than the last We paired our wines along with some local food that was so complimentary. Greece also grows eggplants, tomatoes, and olives, so we had to try the eggplant tower and Greek salad and both were to die for. As someone who had never been cliff jumping before, I was a little nervous to give it a try. The spot that locals and tourists alike travel to is known down by Amoudi Bay. It is a bit of a long trek down (and of course up) but the views of the city along the way are well worth it. 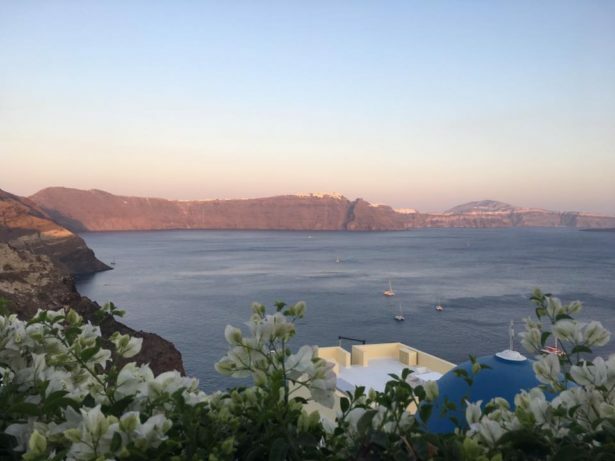 You can honestly see the entire town of Oia from the majestic castle to the Caldera surrounded by the crystal clear waters of the Mediterranean. In order to get to the cliff, you have to swim out to a rock in the middle of the water. Once on top of the rock, hold your partner’s hand, count to three, and take the plunge. The amazing thing about this island is that it only takes an hour to drive all of Santorini and so renting an ATV to explore is a must. From the deep red rock to the black cliffs there is so much to see. We made stops at the Red and Black sand beach as well as the Monastery of Profit Ilias, the tallest point in all of Santorini. Here you will truly feel like you are on top of the world. Santorini is unique in the sense that it is a volcanic island and the island surrounds the Caldera. The best way to see the formation of the island is from the water. When out at sea, take in the views of the traditional town from the distance. The white homes will almost look like snow-capped mountains from afar. 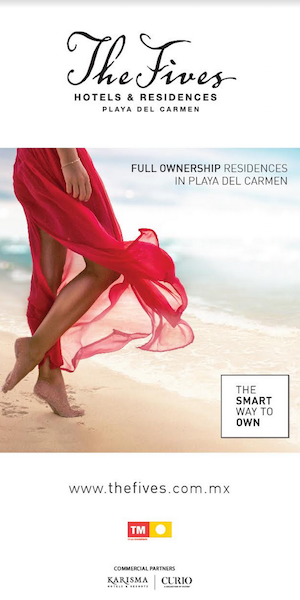 What screams romance more than relaxing with your loved one on the beach while cooling off in the Mediterranean? Doing it on some unique beaches you won’t find anywhere else in the world. 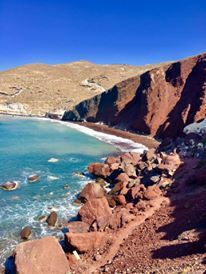 Visiting the Red and Black Sand Beach while in Santorini is a must. The Red Sand Beach has deep red sand and is surrounded by incredible cliffs of the same colour. As for the Black Sand Beach, it is a little more developed. Find a beach chair and relax together. One of the best and most romantic meals of my entire life was at a little restaurant in Oia called Melitini. This little tapas restaurant’s food was so fresh and delicious. Order a bunch of options from the menu and take turns tasting each other’s plate. 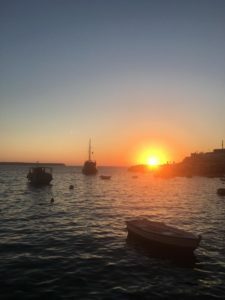 One of the things that makes Santorini so romantic is the picture perfect sunset night after night. Grab your loved one and find the perfect spot to watch this magic unfold together. A lot of people will sit on top of the castle in Oia, but may I suggest making a reservation at a restaurant down in Amoudi Bay. We sat and watched together while sharing a meal at Sunset Amoudi. The fresh seafood was delicious and the view of the sunset dipping down over the water was spectacular. One of my favourite moments from Santorini was just talking a walk around Oia. Stopping to check out some local art galleries and boutique clothing stores. Wander off the beaten path by heading down little alleys on the cobbled road because each one offers a different yet stunning view. Share the magic of the island together and I promise you will leave feeling, relax, rejuvenated, and even more in love. Santorini just has that power.